This summer was a busy time for Projects Abroad with more group trips than ever before away in many of our destinations. The focus of each group trip is always slightly different as the schedule is tailored to the needs and preferences of both the group and the community they work in. We had a couple of groups on building programmes. The Defence Technical Undergraduate Scheme based at Loughborough University was a group of 30 students who went to Nakuru in Kenya to build a volleyball court for a disabled volleyball team. We also hosted a group from Barrow College and Ulverston Victoria High School who worked on a building project at Lemlem School in Ethiopia. A group from Ackworth School built chicken coops for an orphanage in Tanzania. There were also lots of groups out on Care & Community projects including the Anglia Girl Guides in Nepal and the Midlands Girl Guides in Sri Lanka. 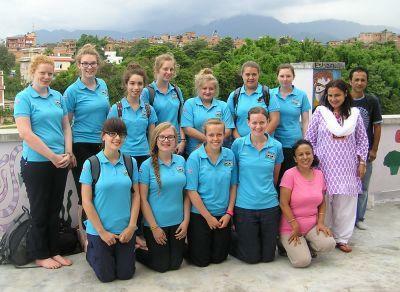 Anglia Girl Guides were helping with a dental hygiene campaign as well as painting at Zing school on the edge of Kathmandu. Oakham School helped with a community health programme in Cinchona in Costa Rica. 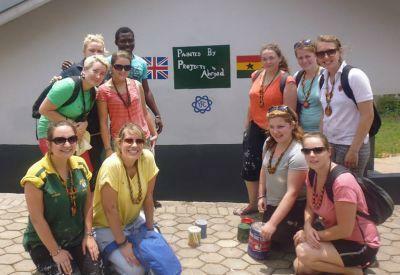 Students from Altrincham Girls Grammar School went on a medical trip to Ghana. A Young Farmers group went over to Ghana to develop a model farm for a village community. For many of the groups joining us this summer, finally arriving in the country was the culmination of months of successful fundraising efforts. Students did everything from sponsored silences, bike rides, cake sales and bag packs to curry evenings, Valentines’ Day discos and even face painting! The Anglia Guide Group created an impressive badge for their Nepal trip which they sold to other Guides to help fundraise for the trip. Once in Nepal they were then able to include the badge in a painted mural that they painted on one of the school walls. If you or your school are interested in organising a group trip next summer or at any other time during the year get some ideas and inspiration at www.projects-abroad-groups.co.uk or call us on 01273 007230.